This tab executes a statistical Report which presents the different prices of each product, as will be described below. This tool is used by the sales manager to follow the purchases history of the client and to analyze it for future customization. This table is for read only and displays the statistical information about the selling prices. For each product, the system presents its catalogic number, quantity sold, first / last Sale dates, official price, lowest price, highest price and last price. Additional information fields can be added according to the users needs and requirements. The data in the table is displayed according to the selected segmentation at the top of this tab. Tax Invoice This option will add the paid products to the table (purchased products with a produced tax invoice). Orders and Price Offers This option will add the products which are included in orders and price offers. Canceled Docs The statistical report will include the sold products from Canceled documents. Price Fields Include VAT/GST Check this check-box to include the VAT/GST in the price fields of the report. After selecting the required filters, press the Execute Report (F5) button. 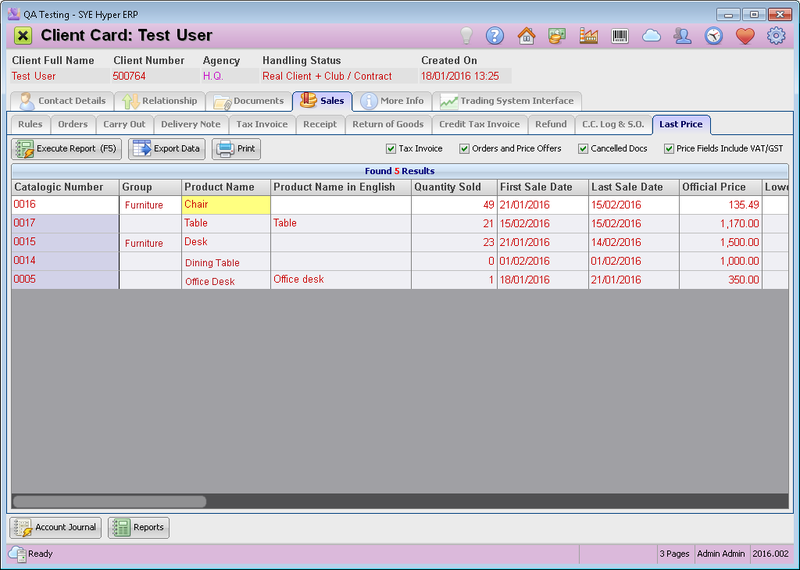 The user can export the data of this report by using the Export Data button. Use the Print button to print the report and for saving it as PDF file or sending it by Email.